Information is written by applying an external electric field, which changes the direction of the ferroelectric’s polarization vector, and this in turn changes the shape of the potential barrier. Information is read by measuring the tunnel current, which depends on the shape of the barrier. Credit: Image courtesy of the authors of the study. Scientists from MIPT have succeeded in growing ultra-thin (2.5-nanometre) ferroelectric films based on hafnium oxide that could potentially be used to develop non-volatile memory elements called ferroelectric tunnel junctions. The results of the study have been published in the journal ACS Applied Material Interfaces. Humans are constantly expanding the volume of stored and processed information, which according to statistics is doubling every 1.5 years. To store this information, we need increasing amounts of computer memory, especially non-volatile memory, which stores information even in the event of a power outage. Scientists all over the world are trying to develop faster and more compact storage devices. The ideal would be a universal memory device with the speed of RAM, the capacity of a hard drive, and the non-volatility of a flash drive. There are many known principles that can be used to build memory, but each one has its drawbacks. This is why modern computers and mobile devices have multiple types of memory. Non-volatile memory based on ferroelectric tunnel junctions is a promising future development. A ferroelectric is a material can remember the direction of an externally applied electric field by the residual polarization charge. Thin-film ferroelectrics have for a long time been used to make non-volatile memory devices, but it is extremely difficult to miniaturize them in order to achieve high density storage capacity; in addition to this, they are made of materials that are incompatible with the production processes used in modern microelectronics. A polycrystalline alloyed film of hafnium - zirconium oxides grown directly on a highly doped Si substrate (upper electrode – titanium nitride). Credit: Image courtesy of the authors of the study. Ferroelectrics are generally insulators and do not conduct electricity. However, if the ferroelectric layer is very thin, electrons can slip through with a certain probability, thanks to the quantum tunneling effect. The probability of tunneling depends on the size and shape of the potential barrier (the energy characteristics of the structure), and the electrons that pass through create a tunnel current. The movement of the electrons in this case is similar to an obstacle course race, and the size of the obstacle is determined by the direction of the polarization vector, which alters the shape of the potential barrier. Information is written by applying a voltage to the electrodes next to the ultra-thin ferroelectric, and it is read by measuring the tunnelling current. In theory, this type of memory may have an extremely high density, fast reading and writing speeds, and a low level of power consumption. It could become a non-volatile alternative to DRAM (dynamic random-access memory). Modern DRAM has a short retention time (approximately 0.1 seconds), after which the data is either lost or overwritten. Using this type of memory requires a large amount of power. Memory based on ferroelectric tunnel junctions could save power, which is especially important for portable devices that run on batteries. However, until now, all prototypes of devices based on conventional ferroelectrics have been incompatible with silicon technology, which is used in the production of most modern chips. The team of researchers from MIPT's Laboratory of Functional Materials and Devices for Nanoelectronics and their collaborators have for the first time experimentally demonstrated that polycrystalline alloyed films of hafnium and zirconium oxides with a thickness of just 2.5 nm retain their ferroelectric properties. 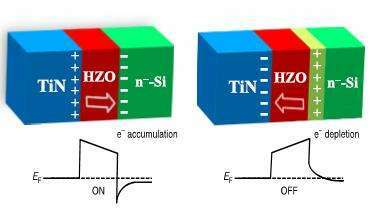 While hafnium oxide is already used in the production of modern silicon logic chips, a few years ago, ferroelectric properties were discovered in one of its modifications. In their study, the scientists from MIPT succeeded in growing an ultra-thin, tunnel-transparent film of this material on a silicon substrate, while maintaining the ferroelectric properties. It is important to note that the the film was grown by Atomic Layer Deposition (ALD) technique. which is widely used today in the production of modern microprocessors, and one of its particular benefits is that it enables functional layers to be grown in three-dimensional structures. "Since the structures of this material are compatible with silicon technology, we can expect that new non-volatile memory devices with ferroelectric polycrystalline layers of hafnium oxide could be built directly onto silicon in the near future," says the co-author Andrei Zenkevich. 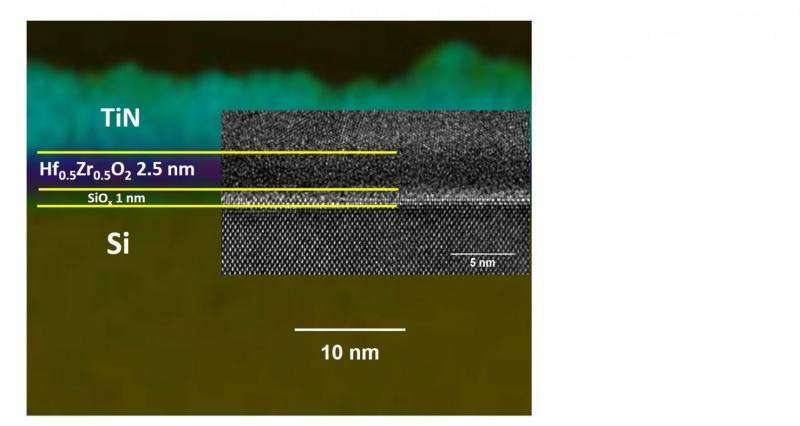 Furthermore, if ferroelectric tunnel junctions based on hafnium oxide are developed, it can be hoped that they will be able to demonstrate memristor properties. This is a prerequisite for creating electronic synapses, which could be used in neuromorphic systems that are currently being developed. These systems have a fundamentally different computing architecture that simulates the functioning principles of the human brain.